When preparing curry, Adam Betz keeps the students’ tastes in mind. For the first batch, he cooks a mild curry to cater to the Elementary students. For the second batch, he intensifies the spice, knowing the tastes of his older clients. 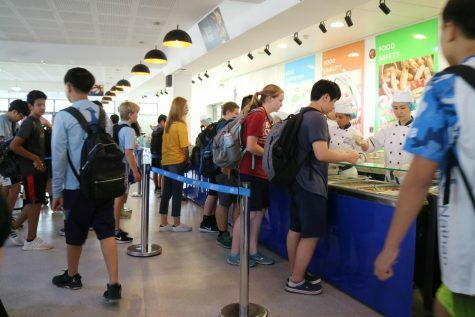 He enjoyed learning how to manage a school canteen, being especially surprised that choices such as lamb and fish are popular for young palates. “It’s been a chef’s job like no other,” Betz says. However, this particular stage of his career is drawing to a close. On the fourth of March, Head of School Dr. Charles Barder announced that Betz, UNIS’s independently contracted chef, would not be returning to cater for the school’s canteen in the 2018-19 school year, having completed one year of his three-year contract. Barder cited the need for an expanded food services team to manage the new canteen, which is currently undergoing the final stages of construction. Such a team has been found in Epicure Catering Co., Ltd., who aim to more effectively and successfully oversee various facets of food services in the school. These include budgeting, food procurement, and food safety, which UNIS states is their highest priority. 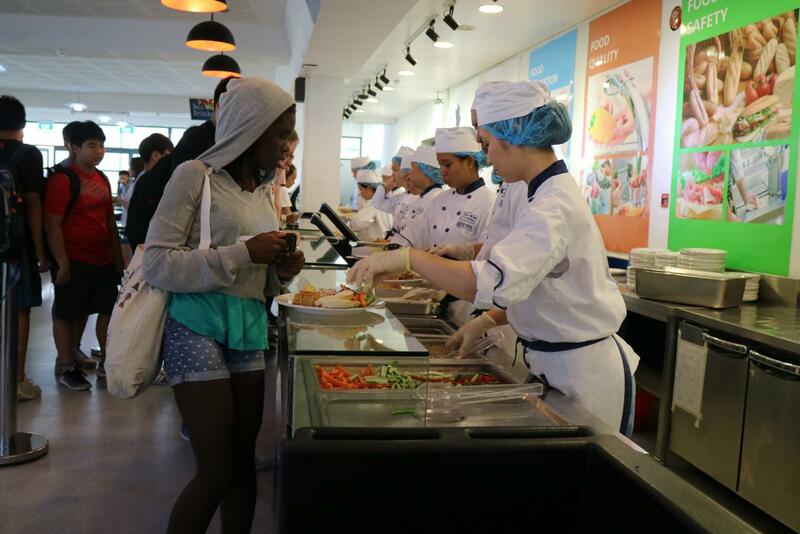 In previous years, the UNIS canteen was managed by Korean catering service J&J Catering Co., Ltd. Teacher Mike Lakwijk advocates for healthy choices in his nutrition lessons, a task he found trying in the years preceding Betz’s employment. Lakwijk cites J&J’s high sugar and fat content, along with the poor quality of food, as obstacles preventing nutritious eating. This has previously resulted in many students ordering from outside establishments. Eleventh grader Kevin Gibney is a longtime UNIS student, having attended the school for seven years. “I can say with conviction that this year has been my favourite for cafeteria food,” he says, citing the diverse food, healthy options, and consistently surprising menu as bright spots. Betz has enjoyed being able to interact with the students, and proving that he and his team can offer high-quality food and not lose money. According to Betz, he and his team serve 560 students and members of faculty on a typical school day, a challenge for which his extensive experience has prepared him. A graduate in Culinary Arts of Le Cordon Bleu at Brown College, Minnesota, Betz first visited Hanoi in 2010. His Mexican restaurant, Salt ‘n’ Lime, is popular amongst both the UNIS community and the wider expatriate sphere. Barder hired Betz as an independently contracted chef, as he desired the responsiveness and level of personality that J&J could never give. NIST International School’s successful transition from a catering company (coincidentally, Epicure) to a chef served as inspiration for this move. Barder was subsequently happy with Betz’s work. When Betz was hired, he and his wife were on the verge of expanding their Mexican restaurant brand, which was put on hold due to his employment at UNIS. “I feel badly that we misled him,” Barder says. As the year progressed, the administration became aware of the magnitude of independent canteen operation. “We hadn’t really thought through as much as we should have,” Barder says. The administration began to understand the potential risks inherent in the operation: namely, that the new kitchen would be three times the size of the current one, and that Betz would not be sufficiently equipped to handle the scale. 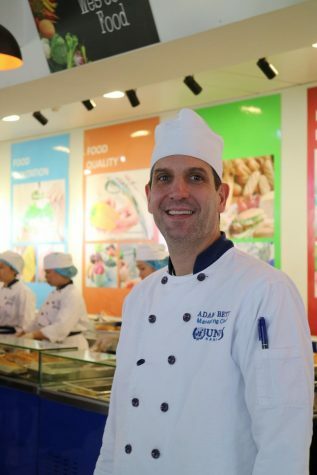 While NIST International School’s host city of Bangkok is developed, with a host of professional expatriate chefs, Barder believes that independent caterers in Hanoi are premature by about five years; international chefs and food safety measures are lacking in Vietnam. “If [Betz] were to get sick,” Barder says, “we’d only be able to survive for a couple of days.” Barder does not believe that the sous-chefs Betz has been training are ready to take leadership positions should Betz be absent. The administration then became aware of Epicure. Several of Barder’s former colleagues had spoken favourably of the catering company. Gibney believes that caterers dehumanise the canteen experience. He criticises the lack of responsiveness of UNIS’s previous caterer, saying that he prefers being able to address concerns with Betz himself. Basile Villars, eighth grade student, has formed a petition to reinstate Betz. “I feel it’s unjust that Chef Adam was removed from the staff even though he had a three year contract with them,” Villars says. Villars’s petition has over three hundred signatures, and he is hoping to collect more. Meanwhile, various other groups have formed, including a third grade petition movement and an eleventh grade group of concerned students. Barder does not believe that introducing the problem earlier would have eased the tense social situation. “You can’t run a school by voting,” he says, despite his acknowledgement that the administration wants the community’s input on decisions that impact them. “It was all lined up,” Barder says. “The dream and the vision [were] there. That was me. I did it.” However, after reevaluating the situation, Barder found that he was uncomfortable with the vulnerability of the new canteen under the watch of an independent chef with limited food procurement and sourcing capabilities. However, Barder believes that the administration has found the best company to serve the school’s long-term needs, while maintaining the high standards set by Betz. Correction 3/9/18: An earlier version of this article wrongly included the opinions of a student who claimed to have attended a school catered by Epicure. The school that this student had attended was not, in fact, catered by Epicure and was instead catered by a separate group.